This is a lesson idea to use as a guide for Father’s Day. It can be adapted for younger students. If it were used in Children’s Church an additional idea could be to have students learn the responsibility of what God expects from children. A Bible Sword Drill game could be played using verses such as Proverbs 4:1, Proverbs 6:20, Proverbs 13:1, Proverbs 15:20, Proverbs 23:22, Colossians 3:20, Ephesians 6:1, Exodus 20:12 etc. Be sure to check out our father’s day craft and coloring sheets. Supply List: If using the Family Fun idea the supplies are listed on that site. Active Option: Play Father Abraham had many sons with the motions. Learning Goal: For some children Father’s Day may be a difficult holiday to celebrate. For the students who have a healthy family life, Father’s Day is an opportunity for them to thank God for their dads. They can honor their dads by sharing their love and appreciation. 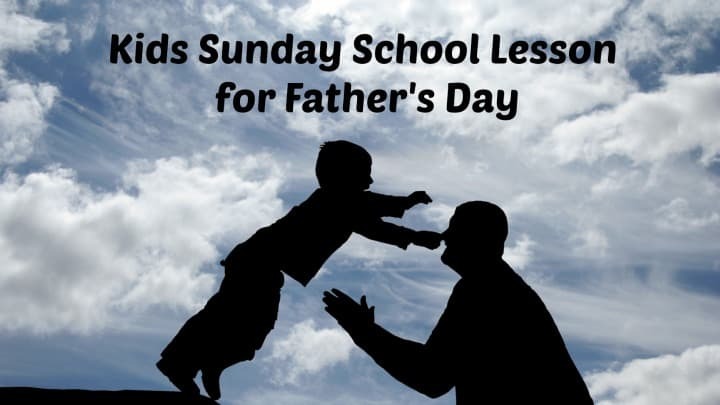 This lesson was created to encourage those students who may not have ever experienced a good example of a father figure. The lesson helps students to see that where earthly fathers have failed them, God our heavenly Father never fails. If students do not have a personal relationship with God through Jesus Christ they will be introduced to the Good News that Jesus died on the cross for his/her sins and was raised from the dead. Craft Idea: Choose one of our Father’s Day craft ideas. How many times did you hear the word comfort? (4) Do you need comfort today? God is the Father of all compassion and the God of all comfort. Talk to Him and tell Him what is troubling you. He can comfort you in ways that no one on this earth can. Are you enjoying a peaceful life? As you pray each day ask God to help you see others that need His comfort. You can share God’s comfort with those who really need it. Adam and Eve began the history of mankind as the first parents. They were given one rule to follow as they lived in the beautiful garden called Eden. Who remembers that one rule? (Not to eat the fruit from the tree of the knowledge of Good and Evil. Genesis 2:16-17) Adam and Eve disobeyed God’s one rule and as a result sin entered God’s perfect world. Every person who has been born after Adam and Eve are born with sin in their heart. That sin keeps men, women, boys and girls from living a life that pleases God. As a result sin has affected God’s perfect design for what He created families to look like. The Bible is filled with a history of fathers. (Depending on the exposure of Scripture of your students you could ask for examples of good fathers and fathers who were not a good example.) Some of these men were good examples as Dads. Some of these men were not good examples of fathers. The same is true today. We know men who are good fathers to their children. We may or may not know men personally who are not good fathers to their children. If we don’t know about these men personally we can read about them in the newspaper or see them on the news. Some children have never met their fathers or they have lost their father through death. Sometimes they no longer live in the same house with the rest of the family because of a divorce. Some dads are not always at home because they bravely serve our country and go to other countries to protect our freedom for long periods of time. God’s perfect plan for a family is for a child to have loving fathers and mothers who take care of their children. Parents are supposed to teach children how to love God and live a life that pleases Him. Unfortunately in this world of sinful people families don’t always look like God’s Biblical plan. If we have good fathers we need to praise God and thank Him for our fathers. We need to show our thanks and appreciation for our dads and let them know we love them. What do we do if we have a father who doesn’t look like the kind of father that God desires us to have? What do we do if we don’t have an earthly father at all? The best place we can go for the answers is God’s Word. Let’s turn in our Bibles to Psalm 10:14 “But you, O God, do see trouble and grief; you consider it to take it in hand. The victim commits himself to you; you are the helper of the fatherless.” If a child has no earthly father he/she can trust that God will help them. God knows every need we have and cares for us. Let’s turn over to Psalm 103:13-14 “As a father has compassion on his children, so the LORD has compassion on those who fear him; for He knows how we are formed, He remembers we are dust.” A human father who is not controlled by sin loves his children and has compassion on them. If an imperfect earthly father can have love and compassion for his children, how much more does God the perfect Heavenly Father have for His Children? In Isaiah 64:8 it says, “Yet, O LORD, you are our Father. We are the clay, You are the potter; we are all the work of Your hand.” God has created each man, woman, boy and girl to have a relationship with Him. He desires to be our Father. The sin problem we inherited from Adam and Eve keeps us from that relationship with Him. “For God so loved the world that He gave His one and only Son, (Jesus) that whoever believes in Him shall not perish but have eternal life.” (John 3:16) You and I can have a relationship with God the Father by believing that Jesus died on the cross for our sins, was buried and rose again. Once a person believes by faith that Jesus paid the price for his/her sins he/she becomes a child of God. As a child of God every person has an Everlasting Father. Read Isaiah 9:6. He never leaves or forsakes His children (Hebrews 13:5) Having an Everlasting Father gives us comfort because we can know that no matter what happens in our lives we can trust God to take care of us as a loving Father would. Each one of us in this class today has different experiences with our families. As we mentioned before if you have been blessed with a godly father and mother praise God and thank Him for that gift. God will help you to develop into the man or woman He desires you to be through their example. Keep your eyes on Jesus and walk with Him every day so you will not live a life controlled by sin. If your experience with family has been difficult you can find peace and comfort from God the Father. If you have never placed your faith in Jesus for the forgiveness of your sins today is the day you can begin a relationship with God the Father. We are here to show you from the Bible how you can be saved. Please talk to us and we will gladly share with you. You can celebrate Father’s Day knowing that you have become a child of God the Father.